This is a long trip with a little bit of walking and little or no train changing. 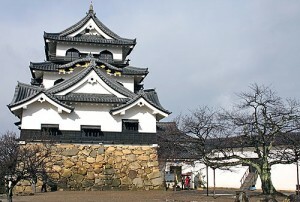 Hikone is a castle town on Lake Biwa, there is a beach on the lake, mountains with a shrine and Zen temple above the town and a castle in the middle of the town. There is a lot to see in a small area. Take the JR towards Kyoto. There is a train that goes to Maibara which is the stop after Hikone. If you don’t catch that one you will probably have to change in Kyoto, but stay on the same line (Tokaido main line). From the station if you walk straight ahead you will come to the castle. From the castle you can make your way to the beach or in the other direction to the mountains. It may be difficult to find a way to cross the railroad tracks – there are not many crossings. There is a good climb up the hills to the shrine and temple with great views of the city and castle below, and Lake Biwa.